Botrytis cinerea is one of the most common diseases in the process of raising eggplant and bean vegetables in recent years. After the cotyledons became infected, the leaf margin began to turn green and yellow, and then dehydrated and dried off. The young stems were mostly infected at the nodules, and they were water-stained and died after soft rot. When the true leaves started, the sharp edges of the leaves started and the lesions developed. Dry dead. In the late stage of seedling growth, in the event of a rainy day for three or four days, the diseased part of the plant will produce gray moldy material, and the diseased heat will develop rapidly, and death will be caused by death, and the whole vegetable seedling will be destroyed. Its comprehensive prevention and control measures are described as follows: 1. Choose high-lying, smooth drainage, fertile, loose, leeward sunny dry land as bed. 2, bed soil try to use disease-free newcomers. Use old bed soil or vegetable garden nursery, 5m carbendazim WP per square meter, 5g, or 5g thiophanate-methyl wettable powder 5g, mix with 5 kg dry fine soil, spread in The surface disinfection. Before the application of pesticides, it is advisable to water the soil on the nursery garden first to avoid excessive watering after sowing and to aggravate the condition. 3. The manure and compost used for the seedbed should be piled on the bed and fermented and dried before application. In this way, high-temperature fermentation can be used to kill manure and compost bacteria, without damaging the seedling root system, but also create dry, loose soil environmental conditions, reduce the incidence of disease. 4, as long as the seedbed temperature permits, it should promptly uncover the cover in order to increase the light intensity, improve seedling disease resistance. Heavy winds and heavy rains should be covered with film in time. After the rain is over, the film should be peeled off in time to avoid the formation of high-temperature, high-humidity environmental conditions and induce the occurrence of disease. Strictly control the number of watering and watering the seedbed. 5, pharmaceutical control. Can use 50% fast-inking WP 1000 times, or 50% nellikon wettable powder 1500 times, or 50% acetaminophen wettable powder 1500 times, or 50% carbendazim WP 600 Double liquid injection, catch the sunny morning, spraying 1 time before and after planting, can control the spread of gray mold. Shou Mei White Tea, also known as gongmei, is a kind of White Tea. Its leaf spread a little bit fat tender, bud leaf is continuous branch, not old branch, whole leaf roll is like eyebrow, aroma is pure. High quality gongmei leaf color is green, the liquor color is orange yellow or dark yellow, the leaf base is uniform, soft, bright, the leaf main vein faces the light fluoroscopy is red, the taste is mellow and fresh and pure.The picking standard is one bud two leaves to one bud two, three leaves, the request contains white.Quality shoumei green color, soup color orange yellow.It is a kind of good health tea. It is moderate in longevity, neither cold nor hot, and anti-oxidation, which helps to discharge toxins and promote metabolism. 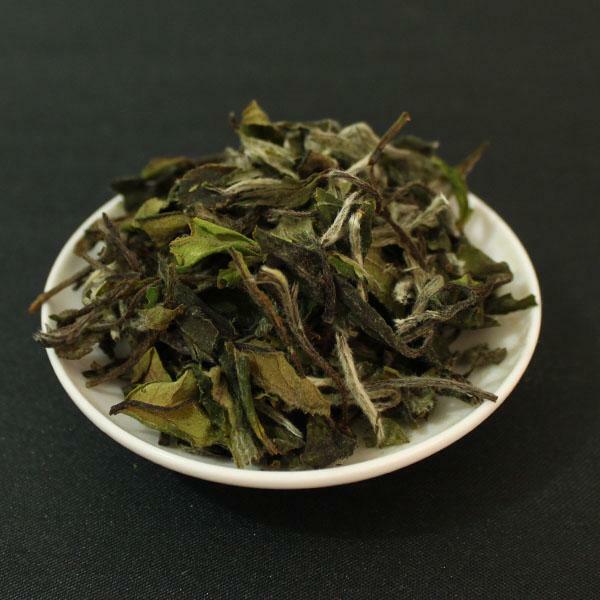 Shou mei white tea are produced by Joy Tea Co., LTD with high quality and good appearance. Welcome you to visit our company. For inqury, please send mail directly.